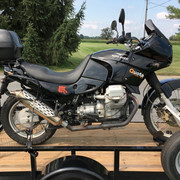 I bought this 2k Quota last September from SRK Cycles in Landisville, PA. (Nice folks to work with!) They posted a couple youtube videos of the bike. It's had all the Quota issues dealt with, and it runs like a champ. All I've done is replace front tire and petcocks. And of course, some TLC. 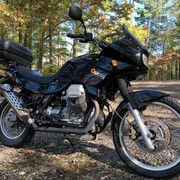 Just curious if anyone recognizes the bike and may have some info on its history. The first picture is from a 2014 Bike-urious post. Second picture is as I picked it up in PA taking it to its new home in VA. Third picture is as it appears now. Thanks for any input. Can't help but welcome to the forum, and enjoy the bike. The state licensing people must have records of the Vin No, is there any way of accessing that information? Where I come from they used to have an ownership record that passed from owner to owner, you could buy a replacement for a few dollars, even now you can access a record of the mileage from year to year at safety inspection time, it will show if the speedo has been replaced or tampered with. Ditto on what Devildog said. There is a decent looking Quota on Reno CL, $3200.